The Crimes Of Grindelwald: Lights, Camera, Magic! Return to the Wizarding World and discover how director David Yates and producer David Heyman brought the thrilling next chapter of J.K. Rowling's Fantastic Beasts story to the big screen. Fantastic Beasts: The Crimes of Grindelwald reunites fans with Magizoologist Newt Scamander and his friends, Tina, Queenie & Jacob as they travel from 1920s New York via London to Paris and encounter a wizarding world threatened by the rise of Gellert Grindelwald. Explore the filmmaking magic behind the story in Lights, Camera, Magic!, and visit a wizard's hatful of brand new locations never before seen on screen. The compelling narrative tells the full story behind the film, from script to screen, with profiles of the key characters and revealing insights from J. K. Rowling, Eddie Redmayne, Johnny Depp, Jude Law and many others. Also included are sections on Costume, Set Design, Make-up, Special Effects & Props, all of which are illuminated by interviews with Academy Award®-winners David Heyman, David Yates, Stuart Craig, Colleen Atwood and a magical army of other crew. 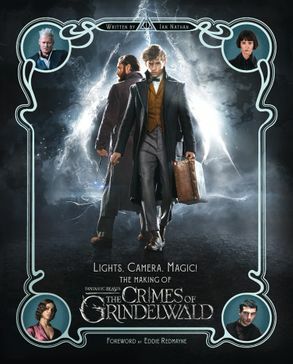 Packed with exciting photos that reveal the filmmaking process in discerning detail, and officially licensed by Warner Bros. Consumer Products, this is the definitive adult companion book to the film, and perfect introduction to Fantastic Beasts: The Crimes of Grindelwald. Ian Nathan is the longstanding executive editor for the world-famous Empire film magazine and has written widely about, or from, the sets of many major movies. His published books include Alien Vault (2011) and Terminator Vault (2013). He is currently developing a book on the Coen brothers and another on the film making career of Peter Jackson.